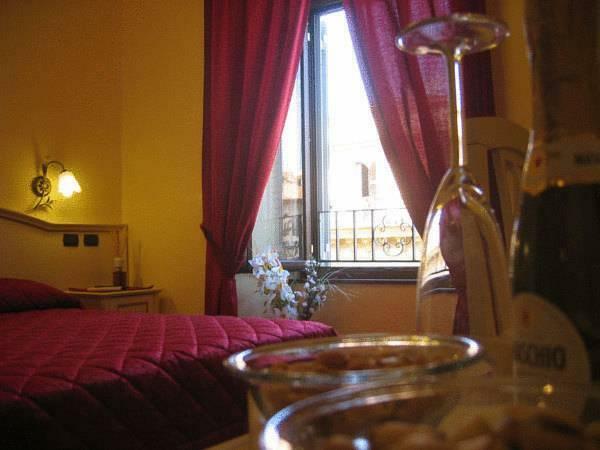 ﻿ B&B Le Suite Di Via Catone Rome. JIMAT di Agoda.com! Ada soalan mengenai B&B Le Suite Di Via Catone? Le Suite di Via Catone terletak di pusat bersejarah Rom. Ia berkedudukan beberapa langkah dari Vatican dan bersebelahan laluan membeli-belah terkenal Via Cola di Rienzo. Di Le Suite di Via Catone, anda akan menikmati bilik-bilik yang ceria, damai dan moden dengan peralatan tempat tidur anti-alergik. Setiap biliknya dimuatkan dengan bilik mandi en suite, TV berskrin rata, Wi-Fi percuma, dan pancuran mandi urutan hidro. Le Suite di Via Catone menawarkan perkhidmatan penginapan dan sarapan. Perkhidmatan pengangkutan ke lapangan terbang disediakan. Stesen Metro Ottaviano terletak kira-kira 5 minit berjalan kaki dari Le Suite di Via Catone. Stesen Kereta Api Termini terletak 6 perhentian dari sini. Bas-bas awam dan trem terletak berhampiran bilik penginapan anda. Please note that the hotel does not have 24 hours reception; therefore guests are kindly requested to inform the property in advance of their estimated time of arrival. This can be noted in the Special Request Box during booking. Anda mesti menunjukkan kad pengenalan bergambar serta kad kredit semasa mendaftar masuk. Harap maklum bahawa semua Permintaan Khas adalah tertakluk kepada ketersediaan dan bayaran tambahan mungkin dikenakan. Sila beritahu B&B Le Suite Di Via Catone terlebih dahulu mengenai anggaran waktu ketibaan anda. Anda boleh melakukan ini dengan menggunakan kotak Permintaan Khas semasa membuat tempahan. Anda juga boleh menghubungi tempat penginapan dengan maklumat hubungan yang telah tertera di pengesahan anda. Location next to Vatican!! !Comfortable room with Air -con.and nice friendly staff. We were very satisfied of the room, and hotel location just about 300 m from Vatikan city, also only 15 minutes walk from the nearest metro. Staff is very helpfull and friendly! The owner was very friendly and willing to help. The rooms were newly converted and everything was well maintained. It is only two minute walk to St. Peters square or to the entrance to the Sistine museum etc. Down side is that the walls are very thin and if you have any noise it is heard though the walls. Standard coffee and crosiant for breakfast but overall very nice. Nice staff that prepared the breakfast and brought it our room. The hotel is in a short walking distance from most of the attractions in Rome. we stayed here for a week while visiting rome in august and was very happy with our stay. the location of the b&b is great - close to the train station and walking distance to all other tourist spots. the staff were very friendly, helpful and attentive. breakfast was bought to the room every morning and was a typical italian breakfast of pastries and toast. the rooms were very clean and comfortable with all of the necessary facilities (especially air-conditioning which was very much appreciated). overall we thought the b&b was great value for money and contributed to a great trip to rome! The hotel room itself was good and clean but it was located on one floor in a block of flats. They did not have 24 hr reception and as a result we got locked out! They gave us keys to all the doors but they double locked it. Not impressed. I would stay there if I wasn't planning on coming back after 10pm. i love the place! its very near the basilica and near the subway...food choices are a lot and shopping is just in the same area! ill definitely go back to this place! We just simply loved the location, size of the room, interior it was amazing. The service too was not bad, except the room is not private. Due to a common door from adjasant room, we could literally hear everythign what is happening in the parallel room. This was bit unpleasent, especially during the night. B&B som ligger i ett vanligt hus med privata lägenheter, B&B ligger utmärkt till, nära tunnelbana för att snabbt ta sig till andra delar av staden och med gångavstånd till Vatikanen. Frukost klassisk italiensk med caffe latte och söta bakverk. Reception var inte bemannad men det gjorde inget eftersom vi hade nycklar men det finns bara personal på morgonen som fixade frukost och serverade i rummet. Små närbutiker i området och möjlighet till shoping också gjorde detta till ett bra ställe för oss. Rummet var rent och fräscht och inga problem med varmvatten men lakan och handdukar byttes inte på de 4 nätter som vi bodde där. Le charme de l'hôtel, situé au dernier étage d'un immeuble italien. La proximité avec le métro et la Place St Pierre. Séjour agréable dans cet hôtel. Service effectué par des Philippins très agréables, souriants et avec un niveau correct d'anglais. Nous avons apprécié la possibilité de faire nos visites à pied et de pouvoir revenir en métro si nécessaire (station à 5mn). Prestation de qualité. Chambre simple mais bien équipée.